ENDOT EndoPure: On the outside, it's blue, color coded to support the industry color coding standards. On the inside it's completely natural; only the purest polyethylene, making it; Lead Free, Chlorine Free and Solvent Free. EndoPure comes ENDOT sealed with our special crimping process to ensure that it remains contaminate free, Guaranteed. For your next project, make it ENDOT EndoPure...and make it as perfect as possible. Purely the best in the business! Endot EndoPure! EndoPure is produced from PE 4710 resin providing the strongest, most durable pipe available. 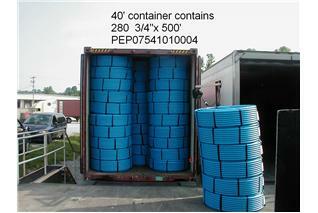 Product made with PE 4710 resin has a 25% higher pressure rating than PE 3408 pipe. EndoPure has a clear core of HDPE providing visible proof of quality and the assurance that no regrind materials have been used to produce EndoPure. EndoPure is produced from HDPE resin with a 50 year track record of quality and performance. This is the same resin used for much of the gas pipe installed in the USA. EndoPure is entirely compatible with all fittings and connectors made for HDPE water pipe and tubing. EndoPure has continuous consecutive footage marks every two feet to assist in installation. EndoPure is UV stabilized for protection from sunlight deterioration. EndoPure printing is permanently embossed. 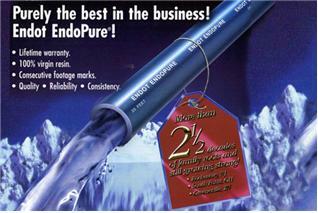 EndoPure is NSF Certified and meets AWWA C901 standards. EndoPure is backed by the strongest WARRANTY in the industry. 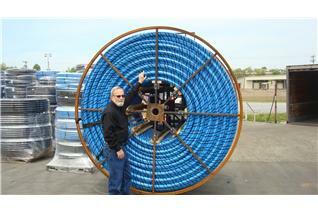 Endot Industries is so confident that EndoPure is the best, most durable pipe and tubing available we provide a Lifetime Warranty and a labor reimbursement 3 times that of other plastic pipe and tubing. ENDOT EndoPure pipe meets the applicable standards of ASTM D3350, ASTM D2239 and NSF-14 & 61.